Weltman on Bamba's Long-Term Potential: "Sky's the Limit"
ORLANDO – When he wasn’t timing the release of his jump shot down to the hundredth of a second, wasn’t doing yoga and pop-up planks to improve hip flexibility that will help him defensively or enduring exhausting boxing-on-the-beach workouts to build stamina, towering big man Mohamed Bamba spent a big chunk of his free time leading up to Thursday’s NBA Draft plotting the ways he will soon revolutionize center play at the professional level. Already in possession of the most expansive wingspan in NBA history at 7 feet, 10 inches, Bamba brazenly believes all the work he’s done in the time since his college career ended at the University of Texas and when his NBA career started with the Orlando Magic will make him a transformational player. After all, how many freakishly gifted 7-footers have the two-way potential of being able to swat shots high above the rim on defense and also bury feathery-soft 3-pointers on the other end? How many big men can soar for alley-oop lobs offensively and also possess the lateral quickness to defensively turn away the drives of cat-quick guards? Bamba’s off-the-charts, eye-popping characteristics make him totally unique – even in a 2018 draft class loaded with difference-making talent. The fact that the 20-year-old Bamba is now a member of the Magic following their selection of him with the No. 6 pick makes the franchise giddy with excitement. The Magic haven’t had an all-star or a playoff appearance in six years and they are highly hopeful that they just nabbed the kind of cornerstone piece who can do for them what Shaquille O’Neal (1992-96) and Dwight Howard (2004-12) did previously on runs to the NBA Finals. ``Sky’s the limit,’’ said Magic President of Basketball Operations Jeff Weltman, who has spent much of the last 29 years evaluating talent for NBA teams. ``He’s already shown that he has the potential to be an elite defender. And, I can tell you from a scouting perspective, when you watch Mo play, you look at his feet, his hands, his frame, his anticipation and you start to think about the things that he can become. And you also envision him in an NBA game where he’s not used in the post, but as a roller or a vertical spacer. 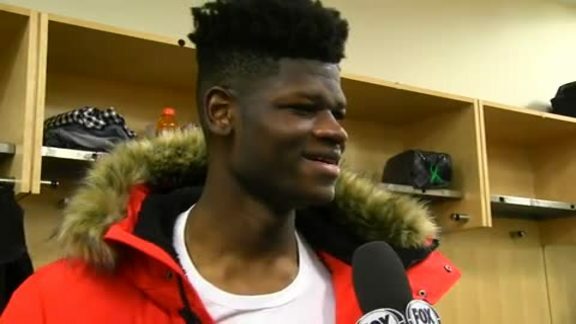 In addition to being something of a Renaissance Man – he’s well-read, well-spoken and has a goal of visiting all seven of Earth’s continents – Bamba also flashed some of the moxie and confidence on Friday that he possesses on and off the basketball court. When he asked about following in the Magic pinstripes of O’Neal and Howard – players who led Orlando to the NBA Finals in 1995 and 2009 – Bamba broke the potentially daunting magnitude of the question with a playful retort. ``The first thing I did was call Shaq and ask him if I could have his Orlando home, but he hasn’t replied yet,’’ said Bamba, who has known O’Neal since his senior year at Westtown High School in Pennsylvania. Despite being a McDonald’s high school All-American and a five-star recruit who was pursued by Kentucky, Duke and Michigan before ultimately choosing Texas, Bamba hasn’t always seen himself as someone who can come into the NBA and change the game. At Texas, his final numbers were somewhat pedestrian – 12.9 points, 10.4 rebounds and 3.7 blocked shots a game – on a Longhorns’ team that was eliminated in the first round of the NCAA Tournament (he had 13 points, 14 rebounds and three blocks and missed his lone 3-point try against Nevada). It wasn’t until after he announced his intentions to head to the NBA that Bamba started to fully grow toward the enormous potential that NBA talent evaluators ultimately see in him. Tucked away in a nondescript high school gym just outside of Los Angeles for twice-a-day sessions, Bamba drilled with famed shooting coach Drew Hamblen – a workout guru for NBA stars Joel Embiid, Jayson Tatum, Andrew Wiggins, Zach LaVine and Jordan Clarkson in the past. After much deliberation, Bamba narrowed the focus for the workouts down to three areas to focus on: perimeter shooting, mid-post attack moves and low-post footwork – and those facets were analyzed to the smallest of degrees. In addition to re-working his jump shot – getting rid of the sling-shot motion where the ball was often cocked-back behind his shoulder – there was a focus placed on the quickness of his release. Bamba has said publicly that a 3-point shot that once took him 0.93 seconds to release now leaves his hand in 0.75 seconds and it’s infinitely more accurate than when he played for Texas. The work with Hanlen wasn’t limited to just shooting as the two often worked on getting his stance lower and making his body more flexible so that he will have the lateral quickness needed to stay on the floor when teams try to get him switched onto guards with explosive first steps and quick cross-over dribbles. Now, following his three months of intensive work, Bamba feels he is much closer to being the player who can make a difference for the Magic right away. ``Excited’’ might be the same way to describe the mood of new Magic coach Steve Clifford, who is downright giddy about getting the chance to work with a big man who can make an impact on both ends of the floor. Clifford was an assistant on the Magic teams that featured Howard and reached the 2009 NBA Finals and 2010 East Finals, and he knows full well the impact a feared shot-blocker can have. Pair Bamba with the length of 6-foot-11 wing Jonathan Isaac and the hops of 6-foot-9 forward Aaron Gordon and the Magic could potentially have one of the most suffocating frontlines in the NBA. The Magic certainly could use a boost on the defensive end as their rankings in the defensive rating category have been mostly dismal for the past six seasons: 20thin 2017-18, 24thin 2016-17, 17thin 2015-16, 25thin 2014-15, 18thin 2013-14 and 25thin 2012-13. With Howard patrolling the paint and Clifford – then an assistant under former Orlando head coach Stan Van Gundy – spearheading much of what the Magic did defensively, they ranked first in the NBA in defensive rating in 2008-09, second in 2009-10 and third in 2010-11. Clifford, who was hired on May 30, hopes that Bamba can have a similar impact on the Orlando defense as well as making them better offensively as well with his unique skill set. ``First of all, he has two strengths that usually translate more than any other from college to the NBA – rebounding almost always translates as does, I think, shot-blocking. When you watch him play, those are the two things that stand out,’’ Clifford said. Bamba will wear jersey No. 5 and make his Magic debut in the Vegas Summer League starting on July 3 (for a practice) and later July 6 (for a game). He feels like the marriage between he and the Magic will be a perfect one because of the mutual desire to be great and the detail-oriented nature of both sides of the relationship. Ultimately, Bamba feels he’ll change the way centers play in the NBA and change the fortunes for the star-starved Magic. ``I think I have all the tools and intangibles to be that transcendent big that the league is now looking at and really wants,’’ said Bamba, who also considers Hall of Fame center David Robinson as a mentor. ``Having the tools and the intangibles mean nothing unless you are surrounded by the best.